The answer is in the data. Or at least, that’s CNN’s story. As Mashable and other outlets recently reported, CNN derived its programming strategy from a variety of data analytics systems combined with TV ratings. CNN was able to draw upon analytics coming from its online properties, as well as TV viewing numbers. This wasn’t too difficult to do as cable companies now have intimate insight into what customers are watching. The numbers were telling CNN that this story was an outlier in terms of shelf life. Most stories diminish in their interest to viewers over time, but not this one. Using data as an editorial tool, the company used a scientific approach, rather than gut instinct or business sense. According to the executives looking at the data, people wanted more coverage on the plane — not less. And more coverage would equate to higher ratings. But what data did they look at? And more important, was it right? CNN uses a wide array of analytics tools to decipher viewer interest. 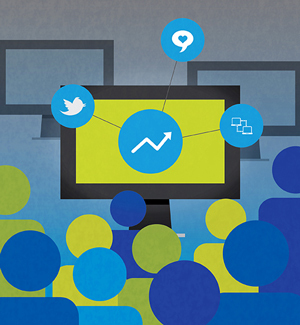 Social media analytics firm Dataminr and microblogging site Twitter provided the means to transform the Twitter stream into actionable alerts, identifying the most relevant information in real time. Using powerful, proprietary machine-learning algorithms, Dataminr instantly analyzes public tweets and delivers the earliest warning for breaking news, real-world events, off-the-radar content, and emerging trends. This social media insight was invaluable to CNN’s formulation to keep the MH370 story going. Content discovery platform Outbrain was also used. The Outbrain content recommendation module determines which content within the network is interesting and relevant to individual users. A larger set of algorithms is run in parallel to determine a set of candidate recommendations. Machine-learning techniques help guide the decision of which recommendations to serve. The algorithmic methods Outbrain uses can be divided into three categories — contextual algorithms, behavioral algorithms, and personal algorithms. In the case of CNN’s MH370 coverage, Outbrain was employed to analyze real-time mobile consumption. Next up, CNN used Chartbeat, which provides services that highlight insights for editorial action in order to determine what content is engaging with viewers. Also used was Optimizely, a service offering online publishers A/B and multivariate testing tools that deliver actionable insights into visitor behavior. The breadth of analytics tools used by CNN shows the extent to which the company is looking at consumption patterns and trends across the Web, mobile, social, video, and third-party sites, and then making decisions about programming for all platforms. The network consistently ranks third in ratings behind Fox News and MSNBC. 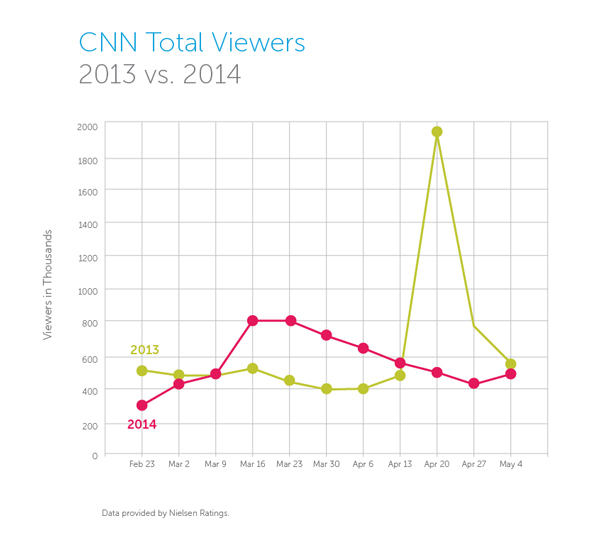 And prior to Flight MH370, which went missing March 8th, CNN’s ratings for 2014 were trailing its 2013 ratings. In the chart below, the pink line represents 2014 ratings with the boost in March during the plane coverage, followed by a gentle taper. The strong spike in 2013 is shown in the yellow line, representing the Boston Marathon bombings in April of that year. Furthermore, in the month of April 2014, CNN pulled ahead of MSNBC in the total day viewers and remained ahead of MSNBC for the second straight month in primetime demo viewers. By continuing with the MH370 coverage, CNN prevented the ratings from a quick spike (both up and down), like it experienced with the Boston Marathon bombings. The network held onto its high ratings as long as it could, beating both its previous year's performance and the competition for an extra five weeks. So in the end, we would say, yes, the data was right, and CNN was right to follow it. The increased reliance on data to drive business decisions should not be done in totality, however. Business experience, or “gut,” is also vital to reasoned actions, but a blended approach toward decision making is advisable in order to get the most balanced result. We call this Man + Machine (as opposed to Man vs. Machine), and it has proven the best route time and again for business decisions. The trick is to carefully examine what the data are saying and why. Only then can you apply traditional business practices to direct the enterprise in a meaningful way. Learn more about how to apply a Man + Machine approach in your business.